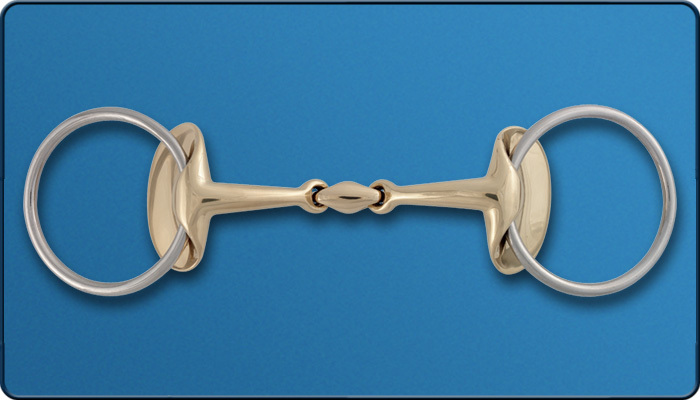 This is a double jointed snaffle. The center lozenge is NOT angled. The Golden Wings bit is the ultimate safeguard for your horse's mouth. It is 100% pinchless. It is gentle and sensitive, with no nutcracher effect. The large discs (safeguard plates) offer optimal protection to the corners of the horse's mouth and ensure the bit always remains in the correct position. It is easily accepted, even by inexperienced horses. A sweet copper mouth offers better acceptance of the bit. It encourages the horse to chew, moisten and relax the mouth. It has massive copper composition (90% copper, 7% iron and aluminum. There is no nickel in this bit. It has a very high strength, stronger than Argentan. We think this is an attractive bit for your special horse. If you prefer a different size, we can obtain this for you. AVAILABLE SIZES: 5 inch, 5.25 inch, 5.75 inch.